eLearning Course: "Smart Grid: From Concept to Reality"
eLearning Talks -- Review of "Cyber Security of ICS"
Ethics training eligible for CEU/PDHs. Topic: Engineering Ethics Ethics are more than just an administrative obligation. Ethics are critical to not only your individual career but also the entire profession of engineering. In engineering terms, ethical standards define the stable operating region for the entire business system. From that viewpoint, broken or out of tolerance interactions are immediately recognized as dangerous. Your PE license renewal requires ethics training, why not learn the rules in the familiar context of engineering? Speaker Biography: Mr. Iliff has over 30 years experience with developmental projects ranging from a few thousand to over a billion dollars, and has participated in all phases of project execution from proposal to close out. He is a seasoned large-project PM, and has managed a wide variety of developmental efforts in aerospace and purely commercial settings. That experience, as well as individual research, has resulted in unique insight on how to effectively run commercial sector developmental projects. Mr. Iliff is currently Vice President at bb7, and Director of Strategy, Methods and Learning. He holds a BS in Engineering / Industrial Design from Michigan State University, an MS in Systems Management, Research and Development from the University of Southern California, and received Honorary Fellow appointment at the University of Wisconsin when he served as the Systems Engineering Manager for the ICECUBE project. Mr. Iliff is a charter member of the International Council On Systems Engineering (INCOSE), founder / prior Chairman of the INCOSE Commercial Practices Working Group, and a member of the Project Management Institute (PMI) and IEEE. A frequent speaker, Mr. Iliff has developed and conducted thousands of hours of training covering all aspects of product development, particularly systems engineering and project management excellence. He is the developer, subject matter expert and master instructor for several PMI accredited courses conducted by Motorola. He has spoken before groups as large as 1,200 people and is a frequent presenter at conferences and professional meetings. July 17th, 2014 at 11:45 AM. Meeting: eLearning Course on An overview of the Smart Grid, details at this link. This is a seminar provided in recorded format by the IEEE eLearning system and is available for PDH/CEU credits. IEEE members may register their credits for free. Non-Members will have a $20 registration fee, if they want the PDH/CEU credits, otherwise there is no charge for the seminar. Be sure to include your IEEE Membership number and a valid email address when you register to log the credits. This seminar is aimed at Continuing Education for the Professional Engineer and is designed to keep you informed of current technical issues. Many thanks to ACS, Inc. for hosting the seminar. Course Content: This tutorial will provide an overview of the Smart Grid. The tutorial begins by explaining what is the smart grid and what are the basic concepts behind it. Next, it discusses smart grid components and develops an understanding of the elements that you need to think about to get a fuller picture of the smart grid. Then the tutorial examines how the smart grid can be realized, and provides some examples of smart grids as they are deployed. Our first summer "off season" meeting using an eLearning seminar from the IEEE Educational Activities Board was held on June 19th at noon. Fifteen people attended the meeting at ACS Facilities in Middleton. The meeting was hosted by ACS at their Middleton thanks to Executive Committee Secretary Brandon Zemlo. Thise in attendence who filled out an evaluation form and provided a valid email address received a PDH/CEU credit certificate that can be used towards Professional Engineer Renewal, or other professional development needs. We plan to hold a Smart Grid Seminar on July 17th at the same ACS facility. We have been told that the "Smart Grid" is coming and this seminar is your opportunity to learn the basics. If it is well attended, we may continue the series in the Fall. If you are interested in having other specific talks in the eLearning series, please contact Tom Kaminski at tjkaminski-at-ieee.org. Available eLearning Courses are provided at this IEEE eLearning site. Chris Meyer gave an excellent, well attended talk on 3D printing that surveyed many of the 3D printing technologies in common use. Chris also demonstrated the most common form of thermal extrusion printing with a printer that evolved from the original Makerbot Cupcake printer. He also advised to first use some of the on-line printing sites and spend about $200 in 3D printing charges before you consider buying your own printer. 3D printers can be purchased for as little as $1200, but they do require maintenance and space. Alternatively, join Sector67, or other Hacker Spaces that give you access to the printers without the responsibility of ownership. One of the sites that Chris showed with extensive 3D printing capabilities (including laser fused metal printing) was Shapeways (see this link). Chris showed a video of a Shapeways 3D printed StrandBeest that gets its motive force from a 3D printed windmill blade blown by a hand-held fan. A picture of the device is shown below. On a more personal note, I joined Sector67 in June and have had a wonderful experience learning how to 3D print and Laser Cut parts that I wanted for my quad copter designs. I learned how to use a Constructive Solid Geometry program called OpenScad (free, open sourced, and cross-platform) to form both 3D parts and 2D parts (flattened into a DXF format for use with the Laser Cutter). It has been a blast seeing parts that used to take me hours to cut by hand being printed in a short time. 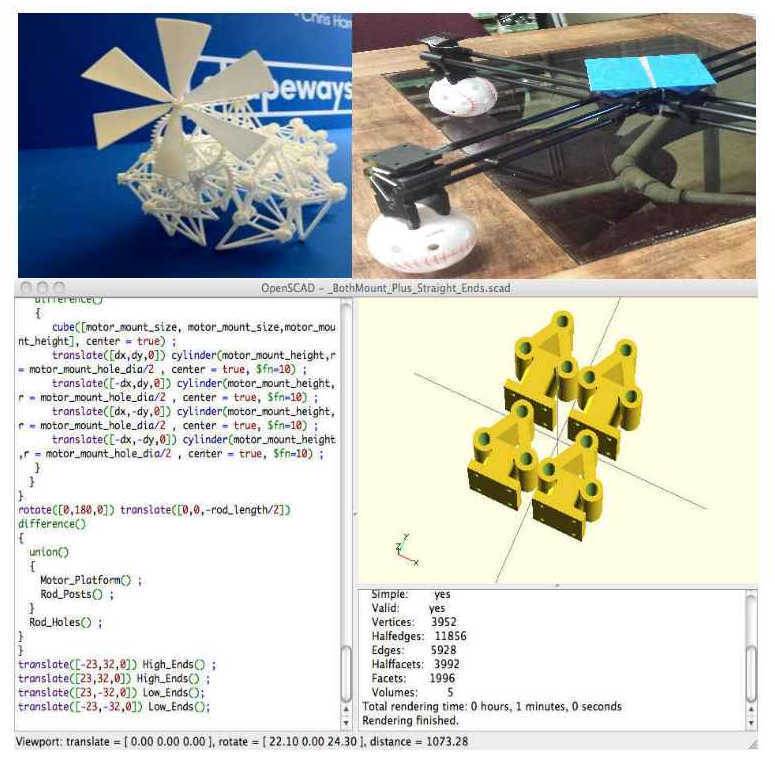 The pictures below show the current Quad design and one of the OpenScad programs used to create some of the parts. My first 3D printed and laser cut parts were made on the same day I joined Sector67. You should try it sometime!